Do you remember netbook computers? They were all the rage for a couple years due, in part, to their inexpensive prices. But you got what you paid for – a portable, low-powered device designed to do the absolute bare minimum. These days, netbooks have largely been replaced by tablet computers. 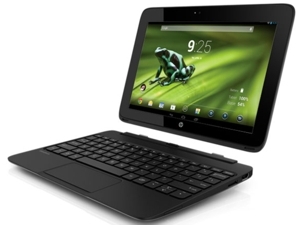 But Hewlett Packard is taking one more stab at the netbook market with the HP SlateBook x2, a tablet hybrid that doubles as a basic laptop computer. Powered by Android Jelly Bean, the device features a best-in-class 10.1-inch HD touchscreen, front- and rear-facing cameras, a quad-core NVIDIA Tegra 4 processor, 64 GB of storage, and an included. What's special, though, is the included detachable magnetic keyboard, which has a built-in touchpad for laptop-like computer and a second battery built right in. It’s the evolution of the netbook. Is the SlateBook worth your money? It's a bit early to say whether it merits inclusion in our list of the best 10-inch tablets, but HP's new hybrid certainly does have a lot going for it. The tablet-esque device starts at $479.99, and it carries many of the features you should expect at that price point. But it does go above and beyond – after all, the detachable magnetic keyboard with touchpad comes included in the price, and that's something other manufacturers charge $150 for. And the inclusion of a second battery means you can squeeze up to 8 hours of fun out of the device, which is simply hard to beat. It’s terrific for traveling with kids, especially considering Jelly Bean’s built-in parental controls. The SlateBook x2 starts at $479.99, and will be available for sale starting August 2013. For more information on choosing the right tablet computer, be sure check out Techlicious's How to Buy a Tablet guide.